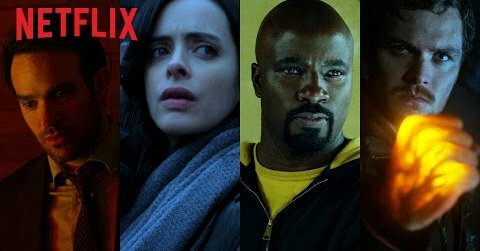 Netflix debut official trailer for Marvel’s The Defenders! Check out the awesome new trailer for the Defenders series, can’t wait for this new series form Netflix! Marvel’s The Defenders follows Daredevil (Charlie Cox), Jessica Jones (Krysten Ritter), Luke Cage (Mike Colter) and Iron Fist (Finn Jones). A quartet of singular heroes with one common goal – to save New York City. This is the story of four solitary figures, burdened with their own personal challenges, who realize they just might be stronger when teamed together. The Netflix original series will launch globally on August 18, 2017. Where is Hellcat?! Where is Valkyrie?! LOL, I see your point, but it was always going to be these four characters to begin with, maybe more will be introduced? I enjoyed the Daredevil Netflix series, so I’m looking forward to this. This looks like a lot of fun. I really need to catch up on Daredevil and then watch Luke Cage. From what I’ve heard, Iron Fist isn’t worth watching though, so I might skip that one. Nice, I’ve been waiting for this trailer. The Iron Fist punch on Luke’s jaw is cool, looking forward to this series. I’m not really that excited. I really liked Daredevil but I was not overly impressed by Jessica Jones, Luke Cage or Iron Fist. The trailer looks fun and it might work because they have good chemistry (it seems ) but I’m definitely more excited for the first season of the Punisher. I liked Daredevil best out of the Netflix shows so far that I’ve seen. I didn’t mind Luke Cage or Iron Fist, but don’t think they were a patch on Daredevil. Not seen Jessica Jones, never got around to that series. I’m looking forward to The Defenders, they seem to have a good dynamic between them, so it will be interesting to see how their characters develop in the new series. I’m very excited for the Punisher as well, that has so much potential, can’t wait! This actually looks good! The past couple of Nefflix/Marvel shows weren’t as good as Daredevil but seeing all four heroes together is something else. Looking forward to it, though I wish it had some kind of acknowledgement of the comic book version of the team. I’m intrigued. I still need to watch Luke Cage and Iron Fist though. The Defenders I remember had Hulk, Doctor Strange and Silver Surfer! Yes, they were in the original team in the comics, loved that series. This TV series features Daredevil, Luke Cage, Iron Fist, and Jessica Jones. Would be great if they did a movie one day with all the original team in wouldn’t it? Still, I’ll be checking out the Defenders tv series as I enjoyed their Daredevil series so much. Might take a bigger budget using that original team! Been massively looking forward to this ever since Daredevil season 1 and the trailer has me even more excited! With the Defenders on Netflix and the Tick on Amazon, August is going to be a treat! I have not watched the individual shows, but TOGETHER….